Golden Cod makes a yummy yet light meal! This easy to make, fish dinner will give you the satisfaction of eating healthy….. and get you ready for the next party! I am still partial to a fish curry and rice dinner or a lobster bake but my family loves baked fish. Living in the Boston area, we all enjoy the local fresh cod and haddock. I was at Wegman’s recently and saw this gorgeous looking fresh fillet of cod that beckoned me. It was late in the evening and I was tired but could not resist the fresh fish. So I decided to make a quick grilled fish recipe that tastes delicious with a side of coleslaw. The Indian style, figure friendly coleslaw will also buddy up well with this healthy grilled fish. 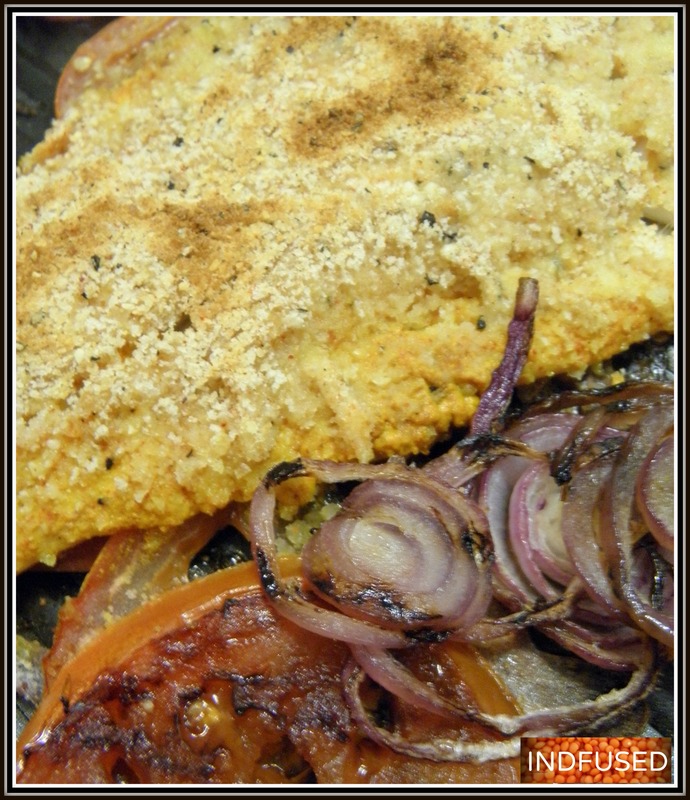 Cast iron grill pans that can go from stove top to the broiler work the best for this recipe. I used garlic, onion and tomato but am also known to have thrown in a few broccoli florets in the pan at times. The crispy broccoli florets add a nice crunch to the meal along with its nutrients and fiber. And by the time you are done cutting the veggies, the fish is marinated and ready for the grill pan. Dinner is ready in 8 minutes! 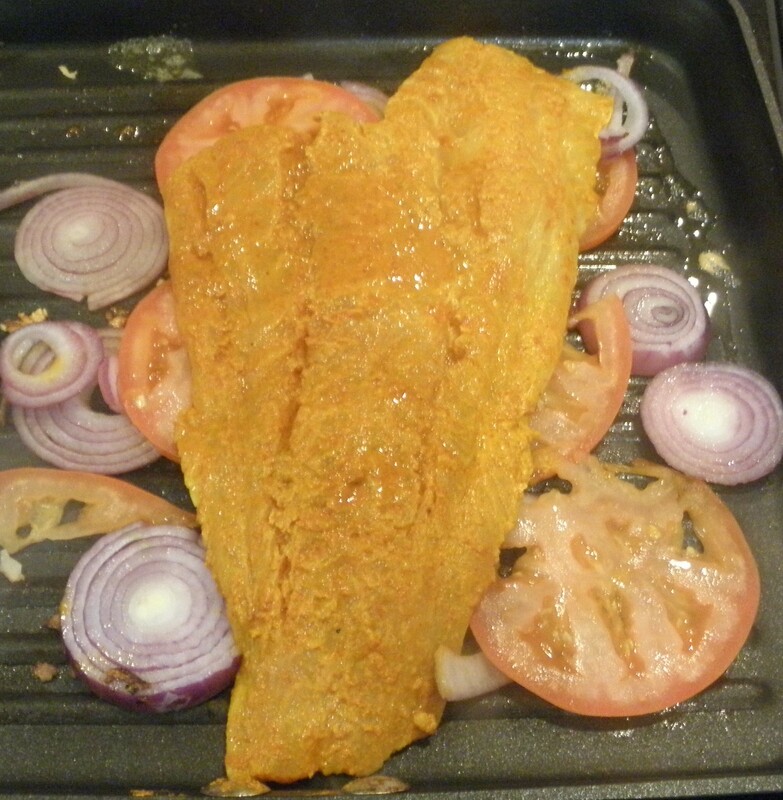 Marinate the fish with the turmeric and chili powders, sea salt and lemon juice. Set aside for 10 to 15 minutes. Heat the grill pan with 1 teaspoon extra virgin olive oil and 1 teaspoon of the butter over medium high heat. Add the garlic, sliced tomato and onion. Top it with the fish fillet. 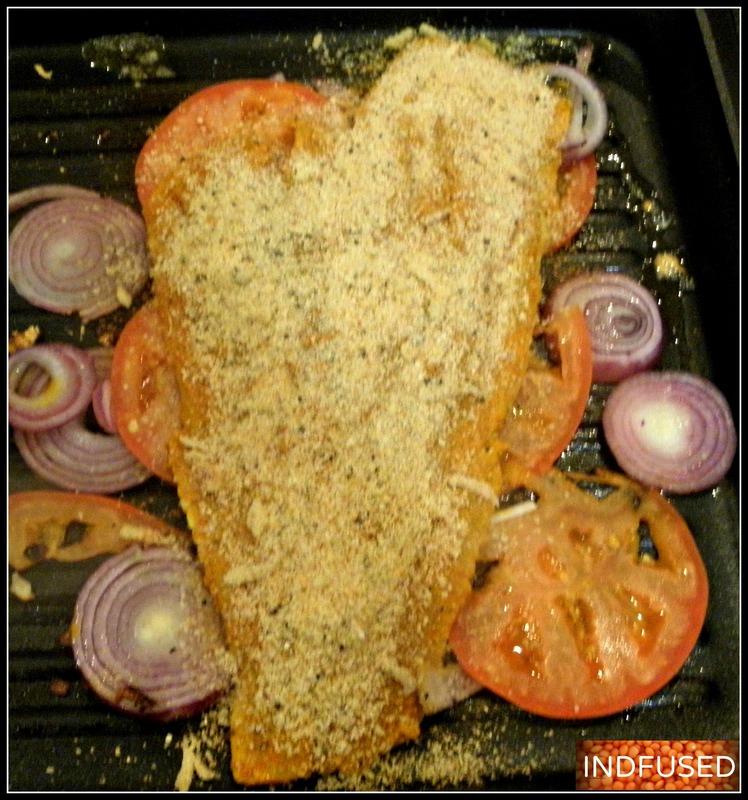 Combine all ingredients for the breadcrumbs and sprinkle them on the fillet of fish. Dot with the remaining teaspoon of butter and cook on low for 7 to 8 minutes or until fish is cooked. Broil on high in the oven for an additional minute or until the breadcrumb topping is golden brown. Serve with the grilled veggies. Hope you enjoy this delicious fish dinner as much as we did!